#1 What to Keep in Your Fireproof Safe? If your house caught on fire, what would you try to save? That is a famous question that has been asked for generations. Some people list some of their favorite items, mention a pet, or simply say, “my family”. We all know deep down that if it came down to it, we would grab our loved ones and run. Our stuff is just stuff. If we can plan to save some items ahead of time by placing them in a fireproof safe, why not? Although it would be difficult to lose anything, some items would devastate us. One important item to keep in a fireproof safe is a gun. If you cannot afford a fireproof safe, it at least needs to be in a gun safe. If you keep a gun for home protection, keeping it locked away in a box in the garage rafters with your ammunition in your bedroom closet defeats the whole purpose. Furthermore, if you do not lock away your gun, you take a chance of someone getting a hold of it and hurting themselves or you! This is especially true for children. Even some of the best behaved children get curious. If you do not have any children, it could be mishandled or even stolen by a friend. If a crime were committed with your registered firearm, you could be in a lot of trouble. Firearms are also extremely expensive. Keeping them in a fireproof gun vault can keep it from being ruined in a fire. It can also keep thieves from using torches to try to open your safe. Documents are also a popular item to keep in these types of safes. Although documents are replaceable, they can be expensive and difficult to replace. Many people put documents such as passports, birth certificates, social security cards, and property deeds inside of these extra protected safes. Plus, storing all these important papers in a secure location that only you have access to ensures you always know where they are and that they are safe from prying eyes or intruders into your home. We have all been in a situation where we are searching around our home for that one document that we were sure was on the table or in a particular stack, but by keeping everything safe and secure in one place, that annoyance is completely erased! Cash is another important item to keep safe. Not many people keep large amounts of cash anymore, but some like to keep emergency cash in their home. Some people will even keep thousands in a jar or secret place. If your house were to be destroyed by a fire, extra cash is an asset that you could certainly benefit from. Waiting for fire insurance settlements can take a very long time, so having that extra cash to help you in the recovery process far outweighs the extra few dollars you spent to get a safe with fire protection. Letting that cash just burn away in a fire could make things very difficult for you in the aftermath. 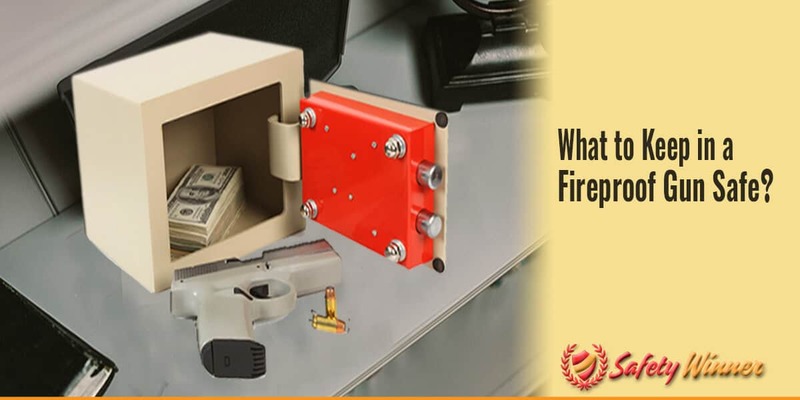 If you keep large amounts of cash on hand, you need to keep it in a fireproof safe. Family heirlooms are another wonderful item to keep in these extra secure safes. Although jewelry and other items are easily replaced, a sentimental value is irreplaceable. Letting your late great grandpa’s watch burn up in a fire could be prevented, so it is best to do so. Not only will fireproof safes protect against a fire, they will protect against intruders. Their construction, professional grade steel, is nearly impenetrable, even to some of the most seasoned thieves. Some argue that a safe deposit box is the best place for documents and jewelry, not everyone trusts a safe deposit box. A bank is much harder to break in to, but the risks are still there. Many people do not trust anyone else holding their stuff where they cannot see it. If you prefer to have your items in your home, buy a fireproof safe to protect them.